Thousands of American high school and university students have walked out of classes in protest against possible conflict in Iraq. The National Youth and Student Peace Coalition, which organised the protests, said that more than 300 schools and universities had taken part across the country, from the southern state of Tennessee to New York City and California. Thousands of students also rallied for peace in the UK, Sweden, Spain, Australia, Egypt and other countries. "We're walking out of our classes because it's completely ridiculous that students in Iraq, who are exactly the same as us, will have to face the consequences of a unilateral war," said coalition spokeswoman Amanda Flott. "Also, at a time when many students are already priced out of higher education, the increase in funding for the military will decrease the money available for education, all to support a war that in my mind is not justifiable." At California's Stanford University, around 300 students marched, some holding placards declaring "It's the Middle East, not the Wild West" and "The majority of us didn't vote for this war". Several professors at the university supported their students by cancelling classes or refusing to punish those who had walked out. "The average student here is pretty liberal and against the war, but they're not very vocal," 20-year-old Kate Skolnick told the Associated Press news agency. "This is mainly about getting people to express their views." Students also walked out from educational institutions in Florida, Tennessee, Ohio, Wisconsin, Pennsylvania, Michigan and Maryland, among others. 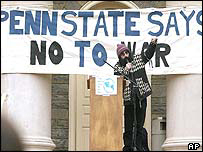 In Cambridge, Massachusetts, home of the prestigious Harvard University, about 100 students left their classrooms to express their displeasure at a possible US-led war in Iraq. "Who says we can be the ones to decide who is safe enough to have weapons?" 14-year-old high school student Anna Ostow said. "We feel like hurting more people is not going to solve any more problems," she added. Meanwhile in other parts of the globe students marched against possible conflict. 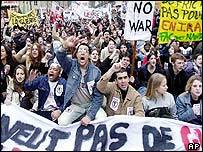 In Paris, a lively anti-war rally drew as many as 20,000 students, police authorities told French news agency AFP, although other estimates put figures at around 7,000. Students danced and chanted their way down the Boulevard Saint Michel, with reggae and Arab music bands accompanying the marchers, many of whom were also protesting against the continuing Israeli-Palestinian conflict. The Spanish capital Madrid also saw tens of thousands of student demonstrators hold a noisy protest in the main Puerta del Sol square as part of a 24-hour class boycott, some carrying placards decrying "servile Aznar" - a reference to the Spanish prime minister's staunch support for the US. In Australia students from schools in Perth, Adelaide and Sydney walked out of lectures as part of a day of action. In Perth, some students burned an Australian flag, while in Sydney others carried banners denouncing the US president and Australian Prime Minister John Howard, Reuters news agency reported. Protests were also held in Britain, Egypt, Sweden and Bangladesh.